Vika has hit bump in the road mentally. ISTANBUL – It is only the second day of the year-end Championships and we are already hearing about players experiencing burnout and looking forward to vacation next week. The season is a grind, whether it’s been shortened or not, but that kind of talk should be left until the final weekend, not the second day of the fifth most important event of the year when eight of the world’s best players are on site. Victoria Azarenka, who went down rather quietly to Jelena Jankovic in straight sets, kicked the discussion off. She said much the same last year after her loss to Maria Sharapova in the 2012 semis, with complaints that she was nicked up. But now she feels fried, even though she has only played 51 matches this year, the least of anyone in the field. Yes, she has been injured at times as well as sick, but she should be able to get her head right for one week before she can take two months off. But it doesn’t seem like she’ll be able to. Yes she does and given how much mental progress she’s made over the past two years, she should be able to find a way to suit up in her armor and give it a real go against Li Na, who is more than capable of knocking her out of the Championships on Friday. But the Belarussian seems to be having a lot of issues. Her struggles with injury and illness this year weren’t massive, but the knee and hip injuries she sustained at Wimbledon did set her back some and then the virus she caught in Tokyo seems to have affected her mood, which isn’t uncommon for anyone, but she’s well enough now and needs to make a rapid attitude readjustment. That is, if she cares to. If anyone has noticed, as well as she played during the US Open Series (except for the third set in in the US Open final against Serena), she is having tremendous trouble holding her serve since Wimbledon. She’s lost pace, accuracy and her kicker isn’t hopping very high. Her camp says she’s having technical issues and that her injuries have not affected her serve, so then clearly she’s lacking confidence. 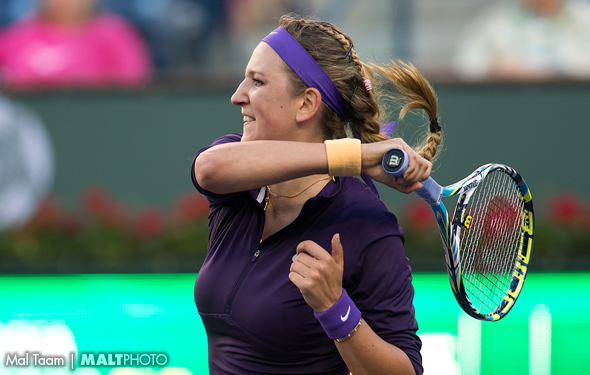 Win or lose or lose against Li, Azarenka needs to show the world just why she has been called a great champion. She needs to pull out a brand new shovel, spike into the ground and begin a big dig. Serena Williams says that she can empathize with Azarenka, but she’s 2-0 after her straight set win over Aga Radwanska. She said that she didn’t travel to Istanbul to mail it in. “You’ve just got to decide if you want to or not,” she said. Serena will face Petra Kvitova in the last match on Thursday night. Kvitova is the 2011 champ and super confident indoors, but defending titlist Williams will be the sternest test she’s faced with a roof over her head in a long time. Radwanska, who is 0-2, will play the second match against Angie Kerber. After the Championships she is going to go on vacation to the beach with her younger sister Urszula. Aga Radwanska and Kerber played a marathon last year in Istanbul. If the elder Radwanska wants to survive another one, she cannot afford to be thinking about which style of bikini she’ll be wearing when she heads south next week. Any win is a good win for Roger Federer these days, but that’s not the same thing as a good performance. Reaching the quarterfinals of his local event in Basel with a 4-6, 6-3, 6-2 win over No. 48 Denis Istomin, he gave the hometown crowds a first-hand look at why their man has had so many problems this season. Each Federer match in the last few months has been closely watched for signs of either imminent turnaround or permanent stagnation, and this latest contest did little to settle the speculation. His error-prone play early on contrasted with his fight and improved form by the end of the up-and-down contest, leaving only uncertainty about what the next round will bring. The packed stadium was quickly quieted as Federer began the match moving sluggishly and struggling his wayward forehand, allowing an emboldened Istomin to take the first set. But the 17-time Grand Slam champ did slowly find some rhythm, producing two statement winners — a Rafa-like curving forehand and topspin backhand down the line — to go up 4-2 in the second and announce to the roaring crowd that he had finally arrived. The defining battle took place early in the third, with Federer missing chances to break in the first game and then finding himself down 0-40 on his own serve before Istomin produced four straight unforced errors to hand back the initiative. Federer also obliged with a few shocking errors, including a missed smash and lurching put-away forehand at net, but managed to hang on to what would be the longest and most significant game of the match. From that point on, Federer’s shoulders opened up and his opponent’s slumped. Istomin, with one day’s less rest between matches, appeared to be tiring and won only one more game — even though Federer served at only 44 percent during the set.